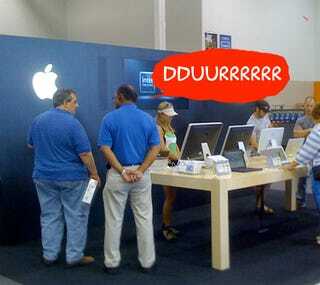 AppleInsider reports that the iPhone 3G will almost certainly be coming to Best Buy as soon as September 7th, giving the the retailer the distinction of being the first outlet to sell the device that isn't part of its immediate family. The announcement, expected tomorrow, would bring the iPhone to 970 Best Buys around the country, as well as 16 more dedicated Best Buy Mobile Retailers. In many ways this seems like a practical move, as Best Buy already sells AT&T phones, carries Apple computers at most of its locations and has sold a tremendous number of iPods for Apple over the years. Additionally, they've just completed a retraining regimen for their mobile departments to help provide slightly better service than we've come to expect from the army of indeterminately bitter, listless teenagers that patrol the appliance and music sections.